Exploration is part of what drives us. It is hard work, with unexpected twists and turns that bring new knowledge and revelations. Exploration can also lead to a deeper appreciation of classic approaches and techniques. 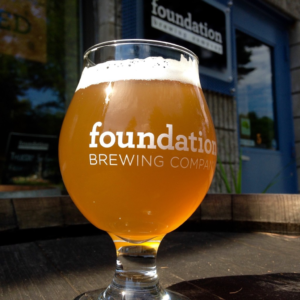 At Foundation Brewing, we seek to build on the classics while weaving in new elements. When it all comes together, we sit back and bask in the afterglow of a new creation. We are proud to introduce Afterglow as an interpretation of the American IPA. The extensive use of classic American hops blended with those from the South Pacific provides an intense and deep citrus note complemented by berry and tropical fruit aromas and flavors. A resinous background lurks under fruit notes, providing depth of hop flavor that rolls across the palate. A blend of both New World and Old World malts intertwine to provide fullness and richness, but still finishing pleasingly dry. The flavors linger, inviting you to sit back, and enjoy long after the last sip is gone. Afterglow will be available on draft in the tasting room on Saturday, September 12th.